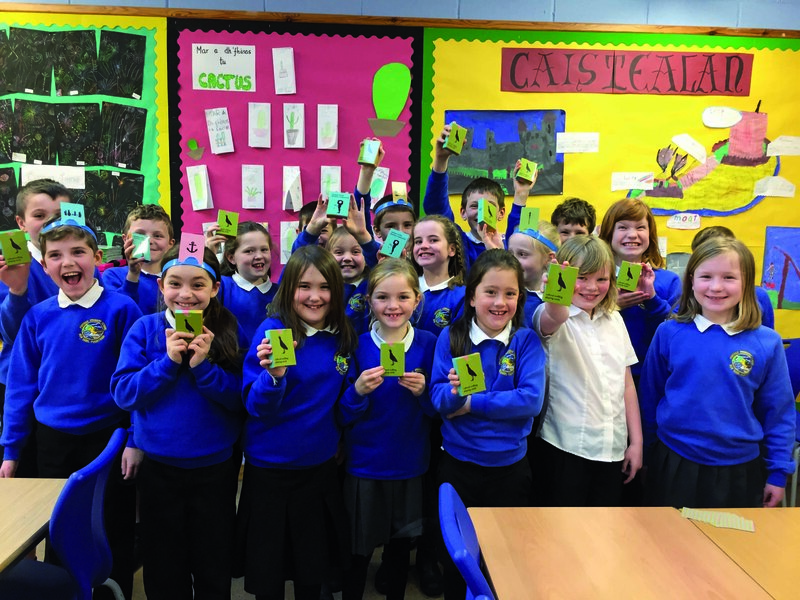 Pupils in Portree Primary School were among nearly 200 across the region to receive a free set of Gaelic playing cards as part of an Atlas Arts’ project. Dualachas Chroitearachd Cairt-Chluiche/Cultural Crofting is the development of a project that began in 2014 when Atlas worked with Craigard Day Centre in North Uist and artist Sharon Quigley on a project called ‘Life on the Land’ to explore the unique heritage and culture of crofting. Part of the output was a set of Gaelic crofting flash cards that reflected both the skills of the group and those of the wider crofting community, characterising through symbols, texture and pattern the interconnectivity of crofting, our culture and landscape. Earlier this year, Atlas commissioned Sharon Quigley and graphic designer Andy Fielding to develop these into a pack of playing cards that function as a fun, Gaelic educational tool and also to increase awareness of crofting, with the aim to distribute to Gaelic Medium pupils free of charge. Atlas also consulted with pupils and teachers in Portree Primary School on the design and what to include in the sets. Shona Cameron, Atlas arts producer, is thrilled by the response: “Last week I took the cards up to Portree Primary School to give them to the class that we worked with on the project,” she said. “It was great to see the pupils playing with them and learning new words.